A WinADay Casino vacation prize winner has returned from a wild weekend in Reno with her sisters -- with more money than she left home with even! The winner, a WinADay Gold VIP player, was drawn randomly from players that qualified in the Game of the Month contest in 2011. 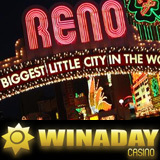 Each month a different one of WinADay’s one-of-a-kind casino games is featured. Players earn tickets toward a monthly draw for $500 in cash prizes just by playing it. At the end of the year, there was draw for the $2000 grand prize vacation package. Jokers Tricks, a 20 payline video slot with a Free Spins bonus feature and Tricks that can double wins, has been the Game of the Month for November at the instant play casino. For December, it’ll be Gladiator Games, a brand new slots game with an incredible animated bonus round.